Newly designed and modular machine tools and assembly systems open up undreamt-of possibilities for an enormous increase in added-value. We have addressed this task and have developed plant engineering into a key area of competence at FELSOMAT. 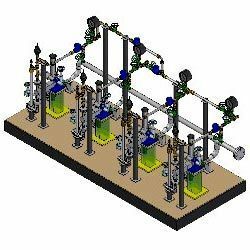 We under take Power plant detailed engineering Activities including 3D Modeling & Isometric, GA, MTO generation using ALL 3D Piping Plant Design Softwares. Our clients spread across various industry verticals associate with us primarily for the width of our Plant Design Engineering services. Our successful track record in offshore project engineering and project management gives clients the required confidence, that they are making a right strategic decision by engaging with us. We at or CKB Group has the widest range of engineering and manufacturing of wind energy components, CKB has provided this services internationally across the globe with its immense manufacturing technology and global reach. We are the leading organization in the market to offer the best quality range of Water Treatment Plant Engineering. Nova-Global has the right resources and abilities to carry out a full-fledged Layout and Engineering requirements of a Manufacturing plant. We have good Maintenance Engineer in Power. - Calculation of Earthing PIT/WELL.